Liposomal Vitamin C is the most absorbable form of vitamin C however it can be very costly if you use it in therapeutic amounts frequently. On the other hand, liposomal vitamin C is not hard to make and can be very cost-effective if made at home. However, this method does not guarantee 100% encapsulation of vitamin C.
Why Liposomal (Encapsulated, Lipo-spheric) Vitamin C? Liposomal Vitamin C provides much higher absorption of the vitamin by our cells compared to other forms of the vitamin. Liposomal formulation enhances the ability of vitamin C to absorb directly into cells increasing the effectiveness. Some experts such as Thomas Levy, MD, JD, say that 6 grams of liposomal vitamin C can provide equal benefits of 50 grams of intravenous vitamin C. Intravenous vitamin C treatments are expensive and time-consuming while making liposomal vitamin C is much cheaper and saves the time. So why not make our own liposomal vitamin C? 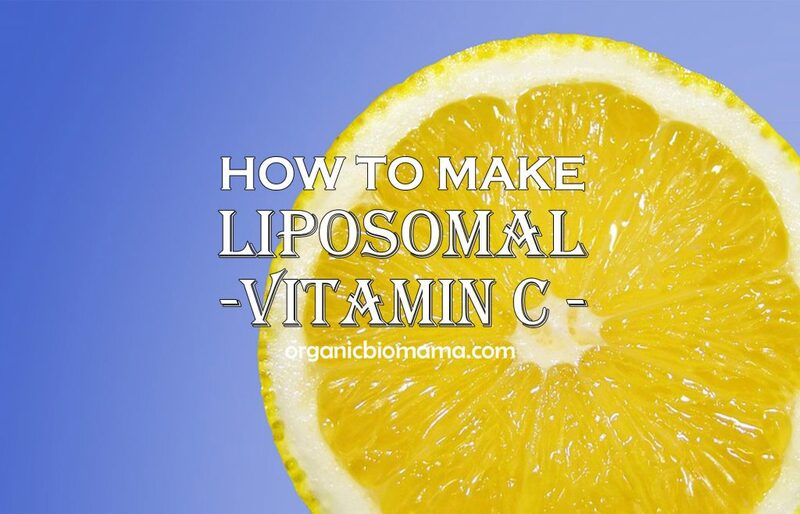 Homemade liposomal vitamin C makes about 50-85% encapsulation according to a crude test, which is still an excellent uptake of vitamin C. Even at 50% encapsulation the person gets at least as much sodium ascorbate as if a person were to receive it in an IV. Which one to use: Sodium ascorbate or Ascorbic acid? Sodium ascorbate is the buffered form of ascorbic acid. Ascorbic acid is too acidic (4.2 pH) and sodium ascorbate is less acidic (6.9 pH). Since the body is slightly alkaline (7.35-7.45 pH), it is best to use the less acidic form of vitamin C to encapsulate. When you take straight ascorbic acid into the bloodstream, the body will have to neutralize the Ph by taking minerals from your bones, teeth, and organs to balance it. It is best to use sodium ascorbate only and not other mineral ascorbates (like calcium ascorbate, zinc ascorbate, or magnesium ascorbate) to make a liposomal vitamin C as the mineral can reach toxic levels in the bloodstream otherwise. How much Sodium in this Homemade Liposomal Vitamin C? One ounce of homemade liposomal vitamin C contains about 100 mg of sodium. If you are worried about the higher sodium intake, you can use ascorbic acid on a short-term basis. Just keep in mind that ascorbic acid will acidify the blood. Pour 30 oz (890 ml) of warm water into the blender cup. Turn the blender on the lowest setting. Add lecithin to the stirring water in the blender. Stir on low until lecithin melts (about 5-10 minutes). In a separate (pint) jar mix 12 oz (350 ml) water and 1/4 cup sodium ascorbate powder. Put on the lid and shake till dissolved. Pour the ascorbate solution into lecithin mixture while still blending on low. Let it blend for 5 minutes. Pour lecithin and sodium ascorbate solution into the ultrasonic cleaner (to the max fill line). It is best to pour the solution into a glass flask and then place the flask into an ultrasonic cleaner to avoid leaching any unwanted substances from stainless steel. Set the ultrasonic cleaner for longest cycle available on the machine. Total homogenizing time is approximately 30 minutes. Stir fairly often using a plastic spoon or a soup ladle. Stirring keeps lecithin moving and encapsulating the sodium ascorbate efficiently. The more you stir the more homogenized is the final solution which is exactly what we want from our liposomal vitamin C. Stirring is critical for encapsulation process. Pour the ready solution into a labeled glass jar. Tighten the lid and store in a refrigerator for up to two weeks. The solution can be used right away. If you are using a sunflower lecithin the final product color is creamed coffee. Otherwise, it can be creamy bright yellow or lemon color. The solution will not be thick. If you want a thick solution you can use less water. See the notes. To make a thicker liposomal vitamin C solution use less water (use about 1/3 amount mentioned in this recipe). Lecithin to ascorbate volume ratio should be 3 to 1. For example, you can use 3/4 cup of lecithin and 1/4 cup of sodium ascorbate. Make sure to completely dissolve the sodium ascorbate in water before you add it to the lecithin mixture. Liposomal vitamin C may taste like a soap. To make it taste better you can add it to an orange juice or other juices and then drink. Put 4 oz of finished homemade liposomal vitamin C into a 12 oz jar. Mix 1 oz of distilled water with 1/4 teaspoon of sodium bicarbonate. Let it dissolve completely. Pour sodium bicarbonate solution into the liposomal vitamin C mixture. Stir. An unencapsulated ascorbic acid reacts with sodium bicarbonate and forms a foam. If the foam is 0.5” or less, it means the encapsulation rate is 50%. If the foam is 3/8” or less, it means the encapsulation rate is 60%. If the foam is 1/8” or less, it means the encapsulation rate is 75%. How much of this recipe is a daily dose? Hi, Rachel! The dosage is calculated individually, so, unfortunately, I can’t recommend any daily dosage here. You can consult with your own health care provider or a naturopath. I myself take 1000mg when I feel sick or in need of some immune boost. I hope it helps, and thank you for visiting my blog:-) Feruza. Hi OBM, I believe what Rachel wanted to know (& me too!) is how much recipe is needed for 1000mg dose? Thanks in advance. Hi, Carol! If you follow the exact recipe, then 1 oz of this liquid liposomal vitamin C will contain 1000 mg of Sodium Ascorbate (vitamin C). I hope it helps! Feruza. no one has ever died from taking too much vitamin c.
think it means. loose stool. Dosage is very flexible and individual.